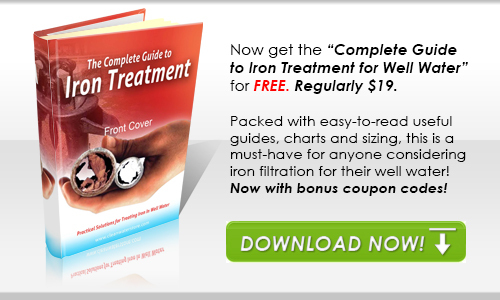 Clean Well Water Report: What Size Iron Filter to Use for a 2 Bedroom 2 Bath Home? What Size Iron Filter to Use for a 2 Bedroom 2 Bath Home? I am looking at the Pro-OX iron filters, but not sure what size to get. We have 2 bedrooms 2 bath 2 people. At one point we were told our well pump could pump 12 gallons per minute, but we do have good water pressure. Thank you for contacting us in regard to the Pro-OX Iron filters we offer. For your home with 2 bathrooms and 2 people we would recommend the 1.0 cu. Ft. size with the optional side tank, along with a Rusco Spin-Down filter to protect the system against sand and the like. Please see below for recommendations, note that all pricing includes no charge shipping within the continental U.S. and no sales tax unless we ship to California. How this particular system works is typically the filter backwashes automatically every 2 to 4 days. Every 2 weeks or so you simply drop a cup of regular Clorox bleach or Hydrogen Peroxide into the tank and allow the filter to backwash normally. Flushing frequency of the Spin-Down filter depends really on your raw water however about once a month is a typical recommendation. A major benefit to using the side tank is this will help to destroy any odors/iron bacteria from building up as well as improving filtration performance. Not to mention the filter media will last for around 10 years before requiring media replacement. Unlike coated filter media such as Greensand or Katalox (which contain only 5 to 10% manganese dioxide, the active ingredient that allows the iron to be removed) our Pro-OX iron filter media uses a solid granular manganese dioxide, that is over 85% pure manganese dioxide. Design of this system will result in clean, non-staining, odor-free water throughout the house without reducing your flow or water pressure. Our 5900e series professional-grade filter systems feature high-flow rates with a minimum of pressure loss, backwash automatically, and are quite maintenance free. Please see below for additional information on this system, your quote, and product links on each item. Pro-Ox Iron filter media contains 80% manganese dioxide in an extremely unique cluster format for enhanced performance and maximized capacity. Works similar to Greensand with superior performance qualities and media life. Typical media life is 10+ years and is NSF certified! Chlorine or Peroxide is to be used approximately every 2 weeks or so by means of the attached solution tank, in order to regenerate the media during a backwash so that it can continue to effectively removing iron and odors. 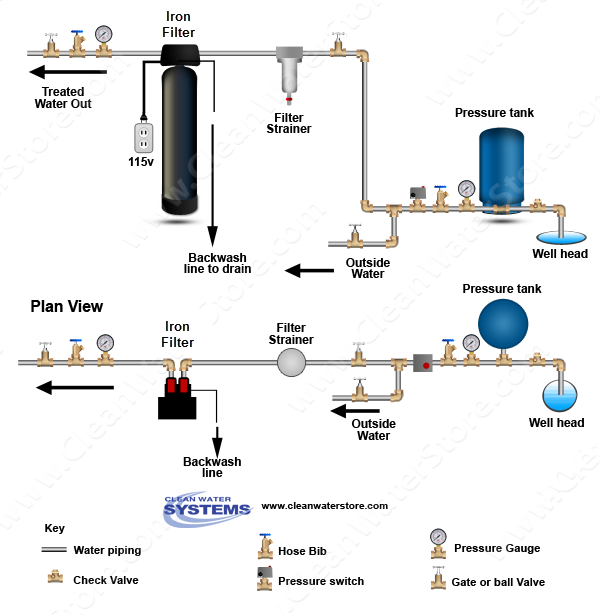 A benefit of this system is that no chlorine will end up in the treated water to the house, it is only used to regenerate the filter medium and then simply flushed to drain during a backwash cycle. Dimensions: 9" diameter x 55" height with valve attached. ¾" or 1” pipe connectors and Bypass is included. All installation instructions as well as professional tech support is available as well. Rusco Spin Down Filter Polyester Screen T Style: 1" Pipe Size, 1" SxS Port (Slip x Slip, for PVC pipes or glued connections), 100 Mesh (152 Microns). Includes 1/2" manual flush ball valve. Spin-Down Sediment Filters are highly flexible filters designed to be utilized in a wide variety of applications. This would protect the Iron filter from sand, debris, etc. with no cartridges to change! If will be used where housing is exposed to sunlight, include optional sunshield.